On March 27, 2013, Sisters Carmen Hernandez and Maura McCarthy celebrated the beginning of their new ministry, La Luz Hispana, in Hampton, Iowa, during a ribbon cutting ceremony with the Greater Franklin County Chamber of Commerce. La Luz Hispana creates a spirit of hospitality where Hispanics can come together to celebrate their cultural strengths and personal gifts. The center, situated in downtown Hampton, Iowa, is a space where Hispanic people can share and build up their strengths, where social isolation is not a barrier, and where hope and a sense of possibility are stimulated. Reverence relationships with all religions and ethnic groups and celebrating the unity of all peoples is a main focus of the center. La Luz Hispana fosters partnerships with educational, religious, commercial, governmental and nongovernmental agencies and organizations. It also provides a combination of educational services and programs that employ dialogue as a way of learning and solving problems—recognizing that all have something to bring to the conversation/table regardless of age, race, and level of education or gender. In keeping with the tradition of Nano Nagle, Presentation foundress, the center's objectives are largely educational. Some of these educational possibilities could include conversational English, composition and grammar, handicrafts, defensive driving skills, computer proficiency, health and exercise, budgeting and managing finances, and citizenship education. All programs are free at La Luz Hispana. 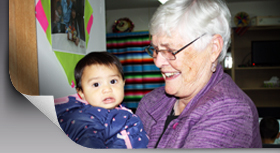 Learn more about the La Luz Hispana ministry.